My RPScore projections had their best postseason since 2013, when they correctly projected the Boston Red Sox to win the World Series over the St. Louis Cardinals in six games. Most of the error occurred on the American League side of the equation. My RPScore ratings continually under-projected the success of the eventual AL Champion Cleveland Indians, ranking them below both the Toronto Blue Jays and Boston Red Sox (teams the Tribe handily dispatched). Picking the Chicago Cubs was the right call, however (and I certainly wasn't alone in that projection). Ultimately, the simulator correctly picked four of the seven postseason series, missing the final result by an average of 1.7 games. The eventual final outcome ranked highly on the list of possible outcomes throughout the postseason. 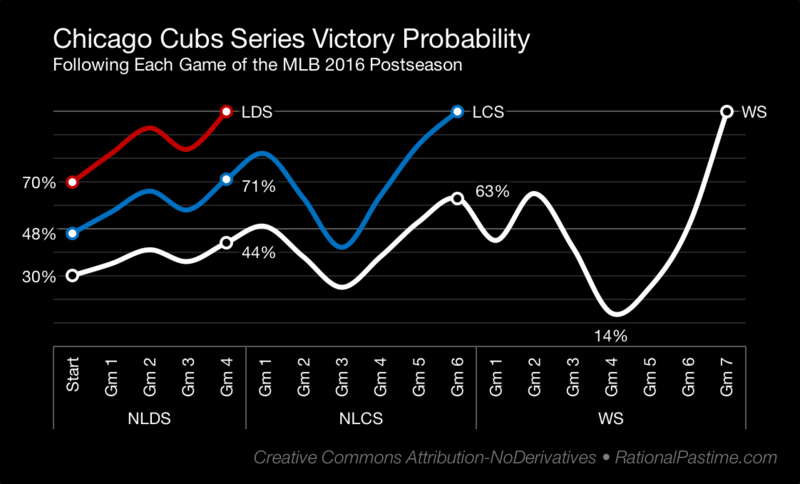 A Chicago Cubs win over the Cleveland Indians in six games was in the top 5% of all projections before the start of the postseason, just outside the top decile at the start of the Division Series, in the top 25% at the start of the LCS and fourth out of eight at the start of the World Series. Always better than a coin flip, the accuracy of the projection suffered as my model continued to underestimate the Indians. 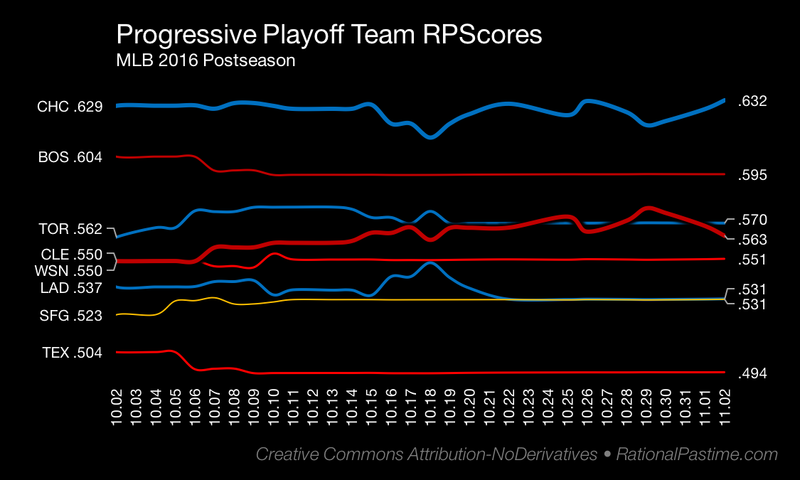 The RPScore rating system was most successful on the margins this postseason, correctly identifying the Cubs as a powerhouse and the top-seeded Texas Rangers as unsustainably outperforming their true record. While keeping in mind there's a wide margin of error here (probably around .050), my power ratings were unable to account for the success of the Dodgers and Indians or for the struggles of the Washington Nationals and Boston Red Sox. Thanks to all of you who have followed my 2016 MLB Postseason projections. I hope you enjoyed reading them as much as I enjoyed producing them.